Swansea City manager Graham Potter praised Wilfried Bony after the striker scored on his first start this season following a lengthy injury lay-off. The Ivory Coast star, 30, ruptured knee ligaments in February 2018 and returned on 10 November as a substitute. 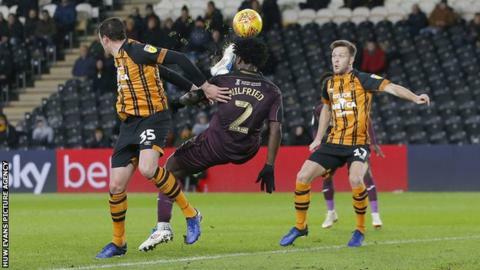 Bony was handed his first start of the season on Saturday, scoring within three minutes at Hull City – although the hosts went on to beat Swansea 3-2. “He’s had to work really hard to get back to where he is,” Potter said. Bony lasted until the 64th minute when he was replaced by Oli McBurnie – Swansea’s top scorer this season with eight goals – after feeling tightness in his groin area. Potter said they would monitor Bony’s fitness ahead of the home match against Aston Villa on Boxing Day. “We’ll see if he can recover for Villa, to be fair we’ll see how that process goes. It’s a short time if you’ve just played your first match after such a long time,” Potter confirmed. Bony was delighted to give Swansea an early lead but felt they should not have let the match slip against the Tigers. “It was a great start, but I think we should have done more than this, scored more than this,” Bony said.